February, 2010 Class III milk and component prices were announced on March 5. 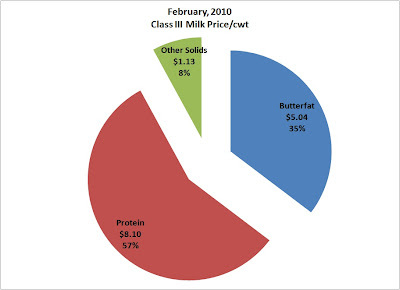 Butterfat and protein prices were slightly down. Protein, the most financially significant important component, was down the most. Cheese prices continued to fall in February as the U.S. dollar strengthened. Imports and exports of cheese have not been announced for 2010, but with the shift in exchange rates, we can expect a decrease in exports and an increase in imports. As analyzed in previous posts, exchange rates play heavily in the cheese supply/demand parameters and the supply/demand for U.S. cheese heavily influences protein and Class III milk prices. The table below shows the data for the majority of dairy pricing parameters. The table starts with the 2009 low of $9.84/cwt in May, 2009. The only component that has moved steadily upward is Dry Whey, which has a very small impact on milk prices. See the April 7, 2009 post to this blog. 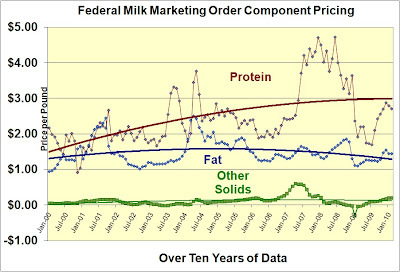 Throughout the ups and downs of the 2009/10 pricing fluctuations, protein has remained the biggest piece of the milkcheck payment. Protein currently makes up 57% of the Class III milk price. 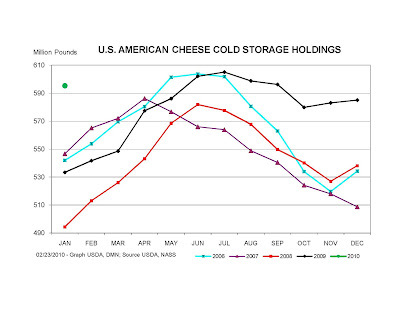 Below is the graph of U.S. American Cheese inventory. The growth appears to be huge and probably is. Some of the increase is resulting from expanded reporting. In a future post to this blog, the increase in it's components of real growth and new reporting will be analyzed. The increase could have a significant impact on the recovery of cheese prices and thereby, milk prices.